Gold foil holiday photo cards have been all the rage in recent years, and it’s really no surprise that the gold foil holiday card trend is still going strong. The Christmas season is the season to sparkle, and gold foil stamping adds shimmer, shine, and sometimes even a touch of glitter that’s beautiful and so very irresistible for so many of us. Since the gold foil trend began, I’ve waited with anticipation to see what the wonderfully talented designers in the stationery and greeting card world will come up with next, and I haven’t been disappointed yet! 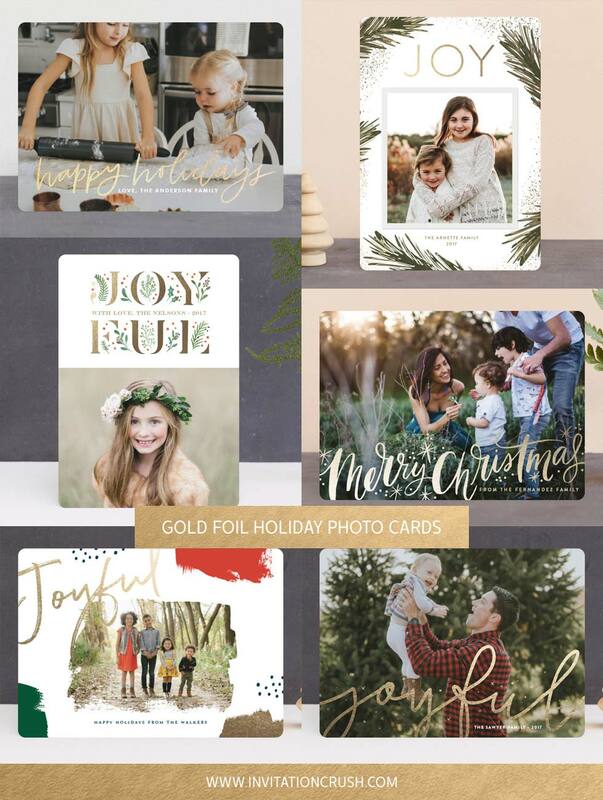 From delicate, gold foil stamped details (think evergreen boughs and berries) to bold strokes and gold foil-filled solids to gorgeous, gold foil stamped hand lettered holiday greetings and sentiments, there’s a little something for everyone when it comes to gold holiday photo cards. The designs in this inspiration gallery of gold foil holiday photo cards cover a spectrum of different styles and combine gold foil stamping with other current trends that include vibrant watercolor backgrounds, organic and abstract, modern splashes and brushstrokes of color, and hand drawn botanical and floral elements that take both the design and the gold foil stamping to the next level. In addition, you’ll find beautiful holiday card designs where the gold foil elements are, literally, the shining stars. Combined with gorgeous hand lettered greetings, gold foil takes the sentiments to the next level and perfectly complements your custom family photo for a finished design that you’ll be excited to send to friends and family this Christmas season. I’m also loving the trend in creating frames and corner highlights that are made up of tiny dots, which look like golden, sparkling snow. And I’m completely smitten with the innovative use of gold foil stamping to add highlights to evergreen branches, flowers, and botanical elements. Now, let’s talk more about how gold foil stamping can work together with color to create stunning gold foil holiday photo card designs. As someone who is absolutely color obsessed, I love seeing not only how designers are using gold foil stamping in a standalone way to create beautiful holiday card designs but also how they’re bringing in color in fun and different ways to blend seamlessly with gold foil stamping to create cohesive designs that shine. You’ll find dazzling gold foil holiday photo cards with splashes of classic red and green, as well as designs that bring in more modern, non-traditional color palettes (think blush pinks and cobalt blues) for looks that are so chic and contemporary. Over the past couple of years, a number of companies have also introduced gold glitter foil holiday photo cards, which combine gold foil and glittery goodness for that little bit of extra something. Gold glitter is a bit less subtle and more sparkly than sheen-y, but it works fantastically with so many design styles. You’ll find beautiful gold glitter foil designs that range from sophisticated to bold and typographic, and the gold glitter foil also works wonderfully for modern, hand lettered holiday card designs and botanical and patterned designs, as well. There’s a whole world of gold foil holiday photo cards out there, and this inspiration gallery features some of my absolute favorite holiday card designs that include this shimmery, shiny element.